Can you imagine that “for every four adults in the world who are malnourished five more are overweight, 30 percent of them clinically obese, according to the World Health Organization”? 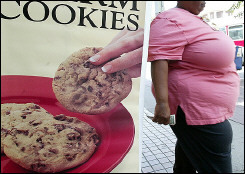 According to AFP, there are one billion people who are overweight in the world, with at least 300 million of them obese. The article continue to explain that “the scourge of obesity, bringing in its train a host of health and economic problems that could one day cripple economies, is more prevalent in some countries than others, but still constitutes a global epidemic, says WHO. A billion people out of the world’s six billion population are now considered overweight, compared with 800 million who do not have enough to eat. Some 2,000 health experts gather in Boston, Massachusetts on Friday for a four-day conference on treatment and prevention of obesity, organized by the North American Society for the Study of Obesity (NAASO). While accounting for less than five percent of the population in China, Japan and some African nations, the proportion of obesity — at the other extreme — exceeds 75 percent in some urban zones of Samoa, and 45 percent among certain demographic groups in the United States, notably among African Americans. And even within China, more than 20 percent of the people in certain cities are classified as seriously overweight. The international standard for determining obesity is the body-mass index (BMI), defined as one’s weight in kilograms divided by the square of one’s height in meters. A person who is 1.80 meters (5 feet 11 inches) tall and weights 90 kilos (198 pounds) will be considered as overweight because his BMI — 27.8 — is above 25kg/m2, and would be classified as obese if weighing 100 kilos (220 pounds), yielding a BMI — 30.8 — above 30kg/m2. In the United States, 30 percent of adults are clinically obese, some 60 million people. In Europe, Britain tops the list with 23 percent, nearly twice the rate in Germany, where 12 percent tip the scales into obesity, according to the OECD. Italy — the land of pasta — only counts eight percent of its population as severely overweight. But even in European countries where obesity is less prevalent, the percentage has increased steadily over time. In France, with a population of just over 60 million, 5.9 million people are obese today, whereas the figure for 10 years ago was only 3.6. Overall, there are some 200 million adults in the EU — fully 45 percent of the population — who are measurably overweight. Rates of excess weight and obesity have climbed to alarming levels among children too, experts say. There are about 14 million overweight pre-teen youngsters in the European Union — at least 3 million of them obese — with an additional 500,000 crossing the line every year, according to recent study by the International Task Force on Obesity. In the United States, the proportion of youth between the age of six and 19 classified as overweight tripled between 1980 and 2002, according to a federal study published earlier this year by the Journal of the American Medical Association. Developing countries are not immune to the problem, experts note. In Thailand, for example, the percentage of five-to-twelve year olds who are obese has climbed from 12.2 to 15.6 in only two years, according to WHO. In general, obesity rates start to climb towards epidemic levels in developing nations as the sedentary lifestyles and rich diets — laden with sugar, fats and salt — common in many Western countries take hold, noted experts and the 10th International Congress on Obesity, held in Sydney in September. The exploding rates of obesity contribute heavily to increased rates of many chronic diseases such as type-2 diabetes, hyper-tension, arteriosclerosis, cerebral hemorrhaging, and certain kinds of cancer. Type-2 diabetes was once a disease that only affected adults, most often advanced in age, but today it has become common even among obese pre-adolescent children, WHO said. This entry was posted on Wednesday, October 25th, 2006 at 4:41 pm	and is filed under Interesting Stuff. You can skip to the end and leave a response. Pinging is currently not allowed.